Considering this many errors and warnings, I previously thought the job had to be done using BeautifulSoup, because it is known to have a very error resistant parser. In fact, BeautifulSoup doesn’t parse the HTML directly, but splits the tags in tag-soup by applying regular expressions around them. Opposing popular stories this seems to make BeautifulSoup very resilient towards bad code. Parsing 20 pages, this takes 167s on my small Debian VPS. Thats 8s+ per page. Incredibly long. Thinking of how BeautifulSoup parses, it’s understandable however. The overhead of creating tag-soup and parsing via RegExp leads to a whopping 302’000 method calls for just these four lines of code. I repeat: 302’000 method calls for four lines of code. On the 20 pages, this takes only 2.4s. That’s only 0.12s per page. lxml needed only 180 method calls for the job. 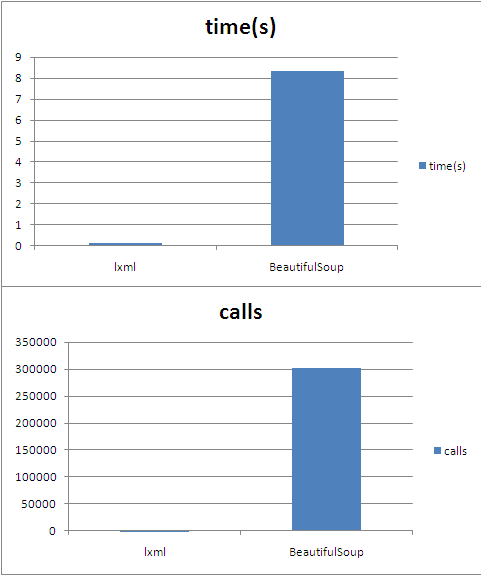 It runs 70x faster than BeautifulSoup and creates 1600x fewer calls. Considering lxml supports xpath as well, I’m permanently switching my default HTML parsing library. Note: Ian Bicking wrote a wonderful summary in 2008 on the performance of several Python HTML parsers which led me to lxml and to this article. Update (08/17/2010): I planned on implementing my results on Google AppEngine. “Unfortunately” lxml relies heavily on C-code (that’s where the speed comes from^^). AppEngine is a pure Python environment. It will never run modules written in C.
Recently my life has been a hype; partly due to my upcoming Python addiction. There’s simply no way around it; so I should better confess it in public. I’m in love with Python. It’s not only mature, businessproof and performant, but also benefits from sleekness, great performance and is just so much fun to write. It’s as if I were in Star Trek and only had to tell the computer what I wanted; never minding how the job actually it is done. Even my favourite comic artist(besides Scott Adams, of course..) took up on it; so my feelings have to be honest. In this short tutorial, I’m going to show you how to scrape a website with the 3rd party html-parsing module BeautifulSoup in a practical example. We will search the wonderful translation engine dict.cc, which holds the key to over 700k translations from English to German and vice versa. Note that BeautifulSoup is liscensed just like Python while dict.cc allows for external searching. First of, place BeautifulSoup.py in your modules directory. Alternatively, if you just want to do a quick test, put in the same directory where you will be writing your program. Then start your favourite text editor/Python IDE(for quick prototyping like we are about to do, I highly recommend a combination of IDLE and VIM) and begin coding. In this tutorial we won’t be doing any design; we won’t even encapsulate in a class. How to do that, later on, is up to your needs. You can either read the needed coded on the fly or download it. Now let’s begin the magic. Those are our needed imports. urllib and urllib2 are both modules offering the possibility to read data from various URLs; they will be needed to open the connection and retrieve the website. BeautifulSoup is, as mentioned, a html parser. Since we are going to fetch our data from a website, we have to behave like a browser. That’s why will be needing to fake a user agent. For our program, I chose to push the webstatistics a little in favour of Firefox and Solaris. Now let’s take a look at the code of dict.cc. We need to know how the webform is constructed if we want to query it. The relevant parts are action, method and the name inside the input tag. The action is the webapplication that will get called when the form is submitted. The method shows us how we need to encode the data for the form while the name is our query variable. Here the data get’s encapsulated in a GET request and packed into the webform. Notice that values is a dictionary which makes handling more complex forms a charm. The the form gets submitted by urlopen() – i.e. we virtually pressed the “Search”-button. See how easy it is? These are only a couple lines of code, but we already have searched on dict.cc for a completely arbitrary word from the commandline. The response has also been retrieved. All that is left, is to extract the relevant information. The response is read and saved into regular html code. This code could now be analyzed via regular string.find() or re.findall() methods, but this implies hard-coding in reference to a lot of the underlying logic of the page. Besides, it would require a lot reverse engineering of the positional parameters, setting up several potentially recursive methods. This would ultimately produce ugly(i.e. not very pythonic) code. Lucky for us, there already is a full fledged html parser which allows us to ask just about any generic question. Let’s take a look at the resulting html code, first. 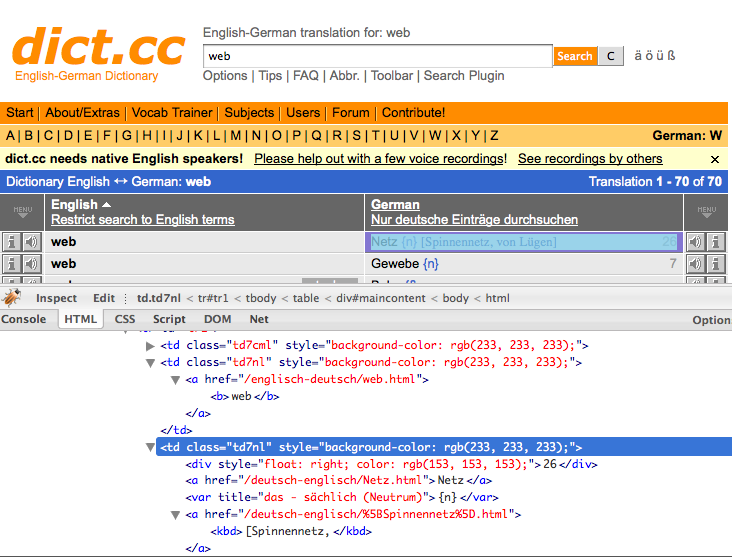 If you are not yet familar with the tool that can be seen in the screenshot; I’m using Firefox with the Firebug addon. This one is very helpful if you ever need to debug a website. Let me show an excerpt of the code. The results are displayed in a table. The two interesting columns share the class td7nl. The most efficient way would seem to just sweep all the data from inside the cells of these two columns. Fortunately for us, BeautifulSoup implemented just that feature. results will be a BeautifulSoup.ResultSet. Each member of the tuple is the html code of one column of the class td7nl. Notice that you can access each element like you would expect in a tuple. result.findAll(text=True) will return each embedded textual element of the table. All we have to do is merge the different tags together. source and word are temporary variables that will hold one translation in each iteration. Each translation will be saved as a pair(list) inside the translations tuple. Finally we iterate over the found translations and write them to the screen. In a regular application those results would need a little lexing, of course. The most important thing, however, is that we just wrote a translation wrapper onto a webapplication – in only 28 lines of code. Did I mention that I’m in love with Python? All that is left is for me to recommend the BeautifulSoup documentation. What we did here really didn’t cover what this module is capable of.